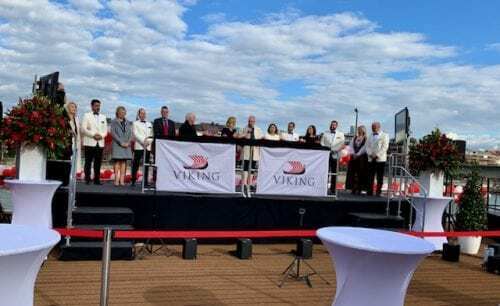 BASEL, Switzerland – Yesterday Viking Cruises kicked off the 2019 cruising season with the naming of seven new river ships. But there was a hitch: Only two of the ships were in Basel. Two were at the shipyard in Rostock, Germany, two were in Brunsbuttel, Germany, delayed by weather and the last was in Porto, Portugal. But Viking put its creative talents to work and devised a “virtual” naming. All of the ships’ godmothers were in Basel, and they blessed their ships via satellite….and a bottle of Gammel Opland aquavit was broken on the bow of each ship in place. 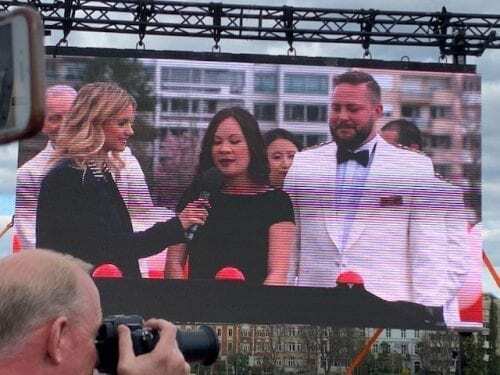 All of it was displayed on large outside screens for invited guests, members of the cruise press and employees and their families. 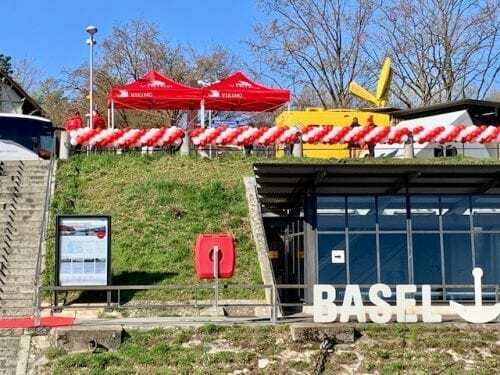 There was a large turnout as Viking’s operational headquarters is in Basel. Even the construction workers in Rostock participated. Of the seven ships, six are Viking Longships bringing the total to 54 on Europe’s main rivers, the Rhine, Danube and the Main. The company also operates another 10 slightly smaller ships on the Elbe, Douro and Seine rivers. The seventh ship, in Portugal, was named the Viking Helgrim and brings the total of purpose-built ships in that country to four. If those names seem confusing, it really isn’t so. Because all of the ships are virtually the same. So when you make a reservation, you may not know what ship you are actually sailing on until very late in the confirmation process. 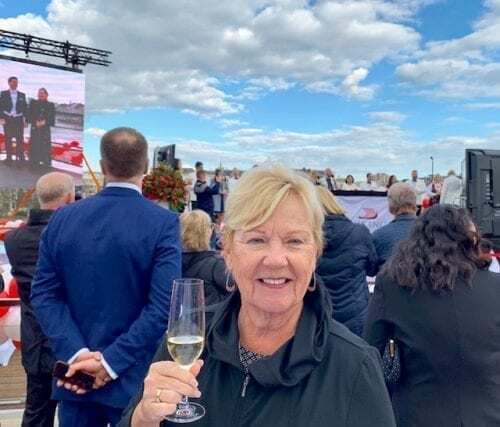 Ship’s godmothers can be anyone from celebrities to members of royalty or the owner’s families but this year Viking opted to select honorary godmothers who are long-serving employees or spouses of senior management. The ceremony was followed by an elegant dinner and concert at Basel’s Fondation Beyeler museum. But more about that tomorrow. Suffice to say it was an extended celebration.